With a water-based polyurethane (PU) construction, the 13-gauge Ansell HyFlex 11-421 Water-Based Flexible Indicator Work Gloves offer hand protection with increased longevity and excellent comfort. They protect hands from risks of abrasions, while allowing them to breathe and remain comfortable for longer. They also feature a green indicator button on the back for quick and easy identification. The product code for the pair of gloves is: 11-421. 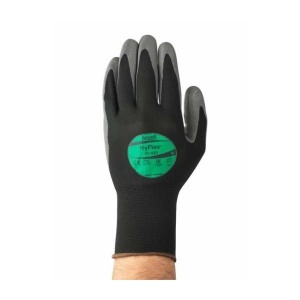 The 11-421 gloves are ideal for protecting hands when working with coarse and abrasive materials, with Level 4 abrasion provided for worker safety. The gloves also allow hands to remain dexterous and flexible for more practical and comfortable working, enabling a balance of comfort and protection while handling and working with potentially harmful objects. The HyFlex 11-421 gloves feature a coloured indicator button on the back. This green button allows quick and easy identification of Level 1 cut resistance. Other button colours include orange and red for Levels 3 and 5 respectively. Being able to identify the gloves at a glance will ensure that the right protection level is worn for the job, while also saving time with finding the right pair of gloves. The table below showcases the test results of the Ansell HyFlex 11-421 gloves according to EN 388 Mechanical Risk specifications. For more information about the conformity of the gloves when in contact with food, please see the PDF below. 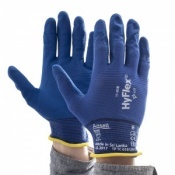 The Ansell HyFlex 11-421 Gloves are available in a choice of sizes, making them suitable for most users. Please consult the table below for details, then select the required size from the drop-down menu at the top of the page. The glove length will range from 220 - 260mm.